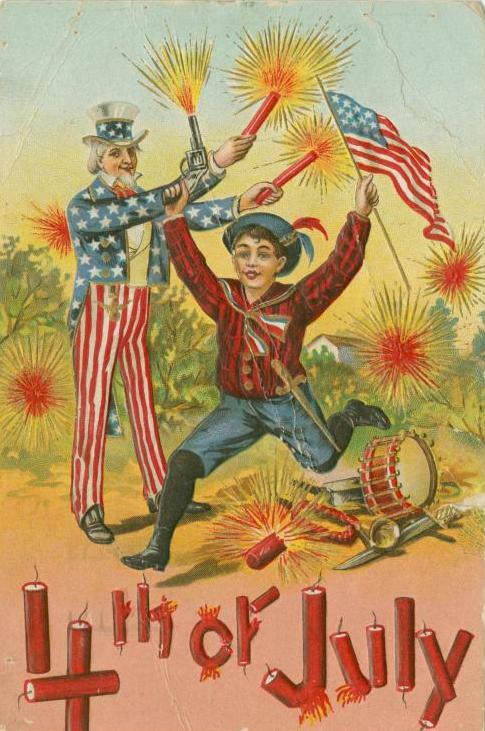 An early 20th Century postcard depicts a boy gleefully firing a pistol in the air while jumping over an exploding firecracker--Julia Rice would put a stop to the "insanity." It was, indeed, a statistic to be applauded. Two years earlier the figure had topped 200. Robert Haven Schauffler, in his 1912 book “Independence Day” spoke of the mayhem on the 4th of July in New York City in the first decade of the century. Mrs. Rice’s pamphlet toppled the first domino in a nationwide campaign for a “safe and sane Fourth.” In 1910 the City outlawed firearms and explosives, much to the verbal displeasure of many. A year later, however, Mayor William Gaynor reflected on the safer and more disciplined celebrations. Julia Rice’s campaign was making significant changes. The 215 dead on July 4, 1909 dropped to 131 a year later; then to 57 in 1911 and in 1912 to 20. Compared to the 5,092 wounded in 1909, there were only 659 in 1912. The mayor of New York City realized that mere legislation would be enough to squelch wholesale misbehavior of Independence Day. Diversion on a large scale was necessary to busy idle minds and hands. A City-organized celebration was established in 1910 under The Mayor’s Committee. The goal was to focus attention on organized events in scattered venues. To keep the children busy and away from pistols and fireworks, each of the city parks held athletic events for over 25,000 children. A parade of the National Guard, patriotic societies, civic organizations and uniformed members of the city departments was held in the morning, ending at City Hall. “These celebrations, conducted under municipal auspices by a Citizens Committee appointed by His Honor the Mayor, were so successful in reducing the number of casualties resulting from the use of fireworks and firearms that Mayor Gaynor, for the first time, appointed a Committee for the same purposes in 1912,” noted the Annual Report of the American Scenic and Historic Preservation Society. The City had spent $15,000 on its first “safe and sane” Fourth and, apparently, felt the outlay was worthwhile. The following year the budget was raised to $50,000, a figure matched in 1912. By now the Mayor’s Committee numbered about 1900 members. The largest celebration centered around City Hall. The building was decorated with “a few large but simple clusters of American flags” and the building was outlined in electric lights. The reviewing stands erected along the Hall’s wide steps were canopied “with striped awning draped in Venetian style, and the section occupied by His Honor the Mayor and the speakers was built in pergola style covered with greenery,” said the Report. Boxes of privet hedge, accentuated at intervals by laurel trees, lined the route by which the marchers approached City Hall. Flowers and plants decorated the front of the stands and the trees of City Hall Park were festooned with electric lights and Japanese lanterns. Fully 5,000 citizens filled the park waiting for the parade. It arrived headed by the patriotic societies led by Mayor Gaynor in an automobile. The mayor was escorted by mounted police and “a mounted herald in picturesque dress with trumpet, and a band of music.” Various military groups followed the mayor. The City Government departments came next, including “self-propelled” fire engines which “contrasted strikingly with the hand apparatus which immediately preceded” them. A Waterous gasoline propelled and pump driven engine was in the parade, the first and only gasoline pump drive engine in the Fire Department’s service at the time. The Department of Parks with its wagon load of growing plants and flowers; the Department of Water Supply, Gas and Electricity; and the Department of Bridges (which pulled a float bearing a 28-foot scale model of the Williamsburg Bridge) came next. As the procession continued, irish and Scot bagpipers played “their weird music” and young women danced. Chinese followed, then Greeks, the Finnish, the Hungarians and other foreign-born groups. The parade was followed by a series of patriotic speeches by politicians and city leaders. That night a “Patriotic Song Rally” was held in City Hall Park that included instrumental music, solo singing and folk-singing. Throughout the day celebrations were staged. “Illuminations, band concerts, literary and historical exercises, athletic games, drills open air folk-dancing and some fireworks characterized these entertainments,” said The Report. And while the goal was a “safe and sane” Fourth, those planning the events knew that “some fireworks” would be necessary to appease the crowds. Permits for fireworks were issued solely for city-authorized events. But even that could go horribly wrong. At 110th Street and 5th Avenue a truckload of fireworks sat waiting for the 4th of July exercises to be completed. Somehow the entire truck exploded during the speech-making. In a similar occurrence, during the fireworks exhibition in Morningside Park, after half of the supply of fireworks had been discharged, an errant spark exploded the remaining pile. 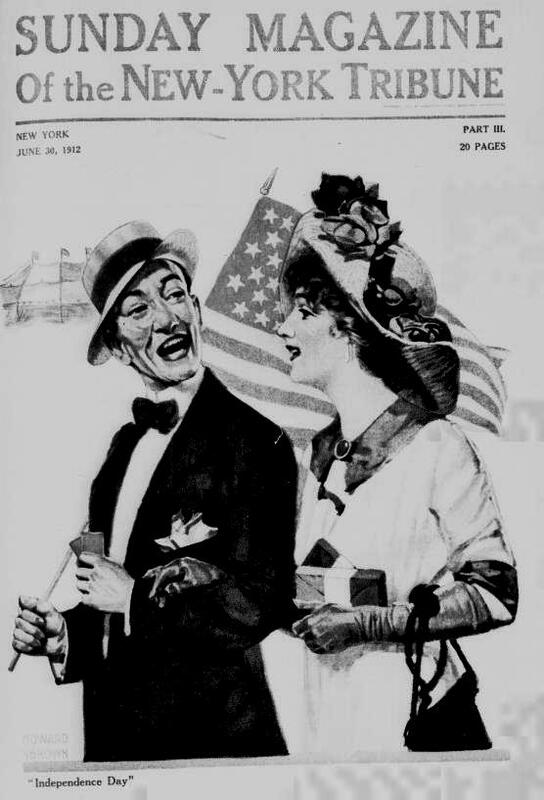 As Independence Day 1912 came to a close, Julia Rice doubtlessly felt a sense of self-satisfaction in the change she had made in America’s celebration of its freedom. The campaign for a “sane and safe” Fourth of July would continue for decades until today the memory of a time when children ran through the streets with firearms and explosives is essentially gone. Oh there is always somebody trying to legislate away the fun..........that is an amazing period postcard!!! Excellent post. Happy 4th, Tom. Herman Ridder was never mayor of New York City. He was the publisher of the newspaper Staats-Zeitung and leader of the German American Reform Union, which was strongly opposed to the Republican pious effort ("Rooseveltism") to rid the city of vice. He didn't favor vice but objected to the fact that drinking occurred on Sundays in the wealthiest homes and in clubs whereas the saloons would not sell to immigrants. You're absolutely right! Thanks for catching that. Ridder was the Chairman of the Committee the year that Mayor Gaynor wrote those words. Again--Thanks so much!